Another much awaited event to be anticipated! COLOURS; A GALA DINNER WITH CHEF GEOFFREY ZAKARIAN. the country's biggest satellite pay tv brand,culminated fashion week with the Colours Gala. This was a fashion show featuring the 2013 collection of former Harrods creative director and London-based fashion designer Lesley Mobo. The stunning array that showcased an evolution of elegant peices was all for the benefit of the Save the World Light Tomorrow Project. This year,Colours,together with Cignal TV is cooking up another red carpet gala that will surely have Manila hungry for more. 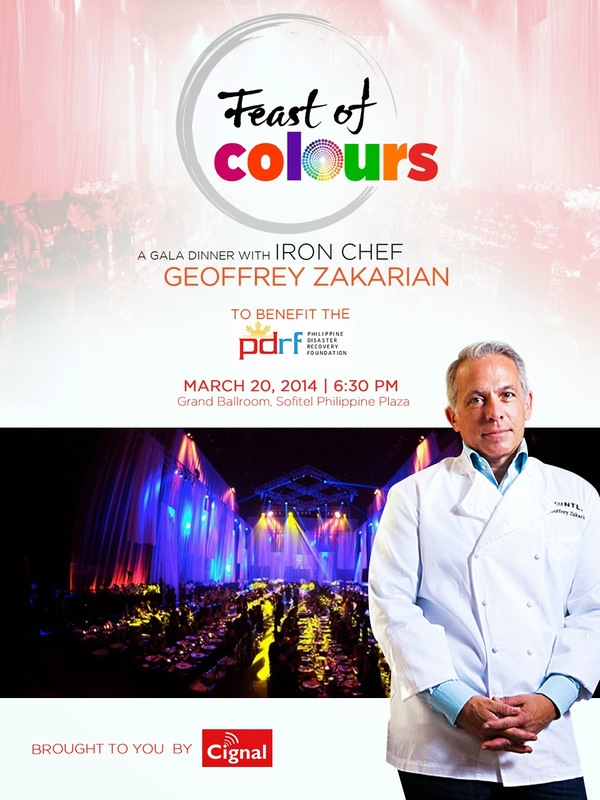 On March 20,2014, Colours presents Feast of Colours, a dinner gala starring Iron Chef Geoffrey Zakarian for the benefit of Philippine Disaster Recovery Foundation (PDRF). The foundation of the country's primary private sector vehicle in disaster management,currently focusing on the victims of the recent calamities. This is event mainly is a culmination of goodwill,fashion,good music,scrumptious food in one. Lets us all join together in this bountiful feast!